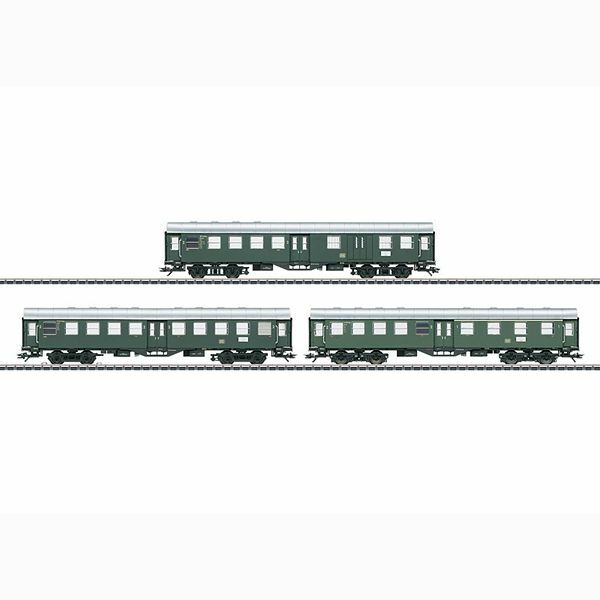 Marklin 41324 DB Passenger 3 Car Set Umbauwagen-Rebuild Cars 41324 Prototype: 3 different 4-axle passenger cars of the German Federal Railroad (DB). Removals Car 1./2. Class AB4yge, 2nd class conversion truck B4yge and 2nd class conversion car with luggage compartment BDw4yge. Operating state around 1958/59. Model: 2nd class conversion car with luggage compartment with Prussian control bogies, conversion car 1./2. Class with bogies of the Minden-Deutz design and second class convertibles with bogies of the American design "Schwanenhalsdrehgestelle". Each car with built-in LED interior lighting and separable, current-carrying couplings. A grinder is mounted on a carriage. For each car, a sliding image set with different carriage runs is included. Length over buffers per car 22,4 cm. Standard built-in LED interior lighting. Sliding image with different carriage runs is included. Insiders Item. Requires signed coupon (may send it latter) order NOW.